Train passengers across England are to be hit by further strike action, RMT officials have said. 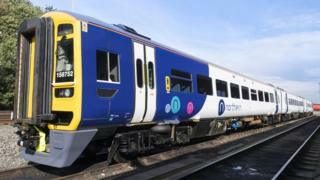 Arriva Rail North staff will walk out for three days from 8 July, while Merseyrail staff will strike on 8, 10 and 23 July, the final day of The Open. Workers at Southern also plan to walk out on 10 July. The RMT is in dispute with the rail companies over driver-only-operated trains which they say would be unsafe and lead to widespread job losses. The strike will also clash with the British Style Collective, the Clothes Show's big event in Liverpool from 7 - 9 July. RMT General Secretary Mick Cash said any responsibility for disruption to services lay with the companies and their refusal to enter meaningful talks with the union. "It is that flagrant disregard for the safety issues at the heart of the dispute which leaves us with no option but to press on with the campaign of strike action," he added. However, Richard Allen, deputy managing director for Arriva-run Northern, said he was "deeply disappointed and hugely frustrated" by the announcement of further action. "Only this week we wrote to RMT again, urging them to engage in meaningful modernisation talks with us. "We have been clear that for all our conductors we are prepared to guarantee jobs and current pay, and continue with annual pay reviews, if we can reach agreement with RMT," Mr Allen said. He added fresh industrial action would not solve the dispute. Merseyrail's managing director Jan Chaudhry-van der Velde criticised the timing of the strike which he said was designed to "cause maximum disruption to people attending the last day of the Open Golf at Royal Birkdale". Mr van der Velde claimed the company "brought several new initiatives to the table in the last round of talks, the RMT is unprepared to work with us to find middle ground". "While we, as always, will do our best to minimise disruption, our passengers should not be made to suffer at the hands of the RMT, and the Liverpool City Region should not be caught in the cross-fire of a national dispute directed by unions in London." The latest strike announcement comes as a long-awaited report into the troubled Southern rail franchise has blamed the unions for widespread disruption over the last year.